Here is just one quick snapshot from Rietje and Sam's beautiful wedding at the Longboat Key Hilton Resort this past Saturday. Despite having to move to the backup plan due to stormy weather, this bride & groom took it in stride and their love for one another brightened the day for all involved. So many gorgeous details (but what else would you expect from a talented pair of graphic artists? ): birds galore - on the table numbers, custom napkins, and in the centerpieces, cheery teal blue & yellow accents, delicious mini-cupcakes, and so much more. Can't wait to share the photos by Mandy and Me Studio! Congratulations Sam & Rietje! 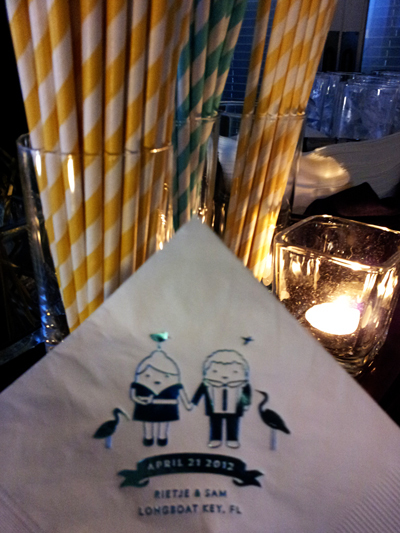 We loved being a part of your special day.